Photo courtesy of Llew Goodfield. Santa Barbara (#116418) (1891-?) 36-foot wood-hulled commercial schooner built in San Francisco for E. F. Rogers of Santa Barbara. Her home port was listed as Wilmington, California. By 1898 there are no further records of her at the Channel Islands. She worked off Baja California, Mexico. What became of her is unknown. 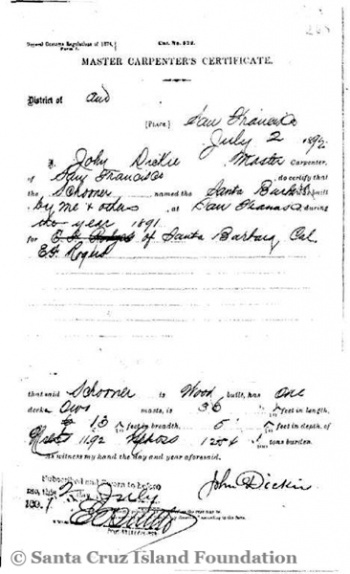 June 4, 1910 [LAH]: “San Diego, June 3—Leaving a woman and child on the uninhabited Guadalupe Ispand, 150 miles off San Quintin, Lower California, A. Marcuson of Los Angeles arrived at San Quintin last Wednesday, after having been at the mercy of the wind and waves for six days in an open boat, and with little food or water. The party of four were on the schooner May, bound from San Pedro to Guadalupe Island. Ten days ago the schooner went ashore on the island. 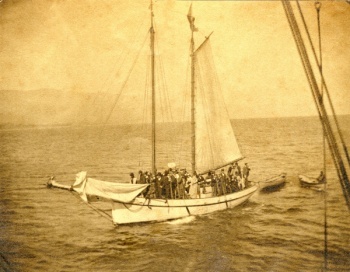 When the news of the wreck reached Ensenada a relief party left in the gasoline schooner Santa Barbara. This page was last edited on 24 July 2016, at 21:26.